A simple yet spectacular way to serve bison sausage. It's time to make street food in your own home! If making it from scratch, make your simple salsa. Gently simmer the sausages for 5 minutes to soften the casing and reduce snap. Steaming the tortillas first makes them taste fresher. Wrap your corn tortillas in a wet paper towel and steam them for a half-minute in the microwave. Warm a pan on medium-heat, wipe it with vegetable oil, and toss the tortillas in there for about a minute. Flip and repeat. Remove the sausages from the grill and let rest a minute. Meanwhile, you can use this time to chiffonade the lettuce and slice the jalapeño. 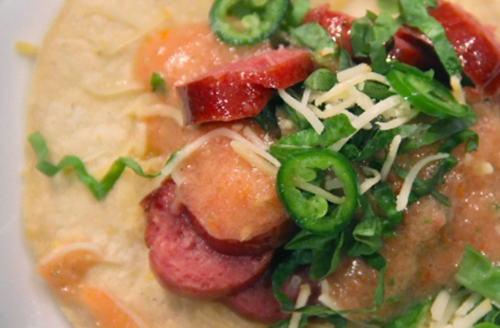 Slice the sausage then layer your tacos with all ingredients. Add a spritz of lime. Serve.